Being America’s #1 Newspaper Comics Blogger is in fact a pretty sweet gig, but sometimes there are heavy responsibilities that go along with it. For instance, you are expected to have opinions about things that you don’t really want to have opinions about, like the end of Cathy! Readers of this blog know that my feelings about the strip range, depending on the day and the punchline, from disinterest to irritation to occasional mild but shameful amusement. In Cathy’s very first mention on this blog, I openly rooted for the Cathy-Irving marriage to herald the demise of the strip; probably if it had wrapped up back then, in the summer of 2004, I wouldn’t have felt a need to weigh in. It is important to remember that when Cathy launched in 1976, it was actively new and exciting and, in the grand scheme of things, good for a newspaper comic to focus on a lady who was unmarried and had a job. 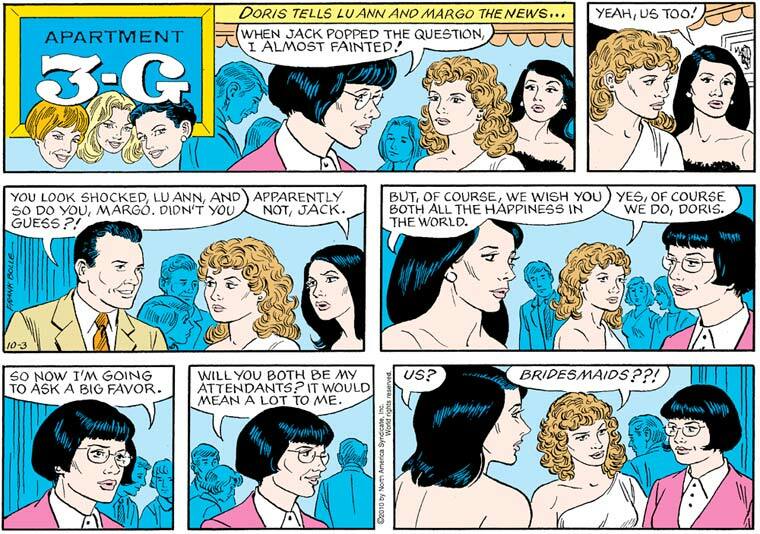 Sally Forth mined some of the same novelty (minus the unmarried part) when it launched a few years later; but Sally was always a more or less fully functional human being, whereas Cathy is a nightmare bundle of neuroses. The fact that the character always seemed to take every negative stereotype about women and extend them to cringe-inducing extremes made it hard to celebrate it as a feminist achievement. But still, there is one thing we can really thank the strip for, and that is only revealing Cathy’s successful insemination in the final strip, rather than subjecting us to God knows how many months of strips about morning sickness. And maternity clothes! Good lord, can you imagine all the strips with Cathy trying on maternity clothes? Sparing all of us this was a true act of mercy.